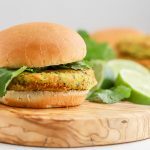 A healthy veggie burger recipe for Thai Chickpea Burgers that’s simple to make and bursting with flavor! Add the oats and almonds to a food processor and pulse until relatively smooth but ensure some coarseness remains to help bind your burgers together. Drizzle a little olive oil in a large non-stick skillet. Cook over medium (or even medium-low!) heat until burgers begin to brown and crisp on the outside. Flip and cook until the other side begins to brown and crisp up a bit, too! Avoid the temptation to crank up the heat on these burgers to give them time to get deliciously crispy on the outside without burning them. Serve burgers on a fresh bun, in a wrap or even crumbled up over a salad.